I’ll let the picture do all the talking. Well, most of the talking anyway. Normally when you think about undead armies you think about hordes of skeletons wielding swords, blunt objects, or nothing, just screaming off into battle ready to tear your face off with their bare bony hands. But that’s not the case in Hackberry Hollow. The only thing more terrifying than a smart enemy is a smart enemy you can’t see. 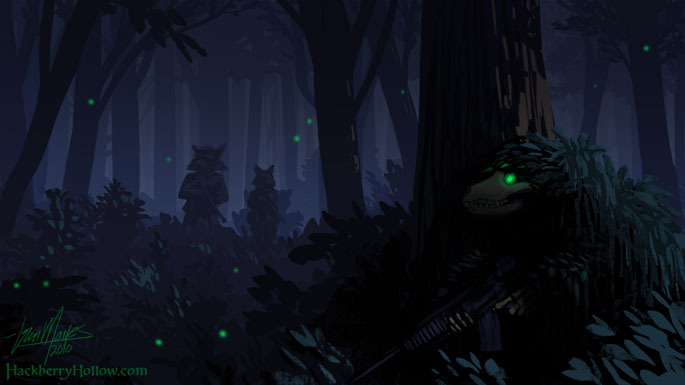 Darn fireflies – anytime you see two close together you think some skeleton wearing a shrub is gonna shoot ya! Indeed, that’s why Necrolampyriphobia is so common these days. Everyone is afraid that fireflies are undead.